W or The Memory of Childhood (1975; tr. 1988 by David Bellos) has an immediate problem in its translation: the French rendition of the letter is not ‘double-u’ but ‘double-v’, which carries much more weight, both allegorical and punning (double-vie or double life for example). This necessitates a foreword by the translator, and makes the reader feel less bad about missing other subtleties. Even so, it is clear that Perec is one of those writers with whom the book you have just read seems to be his masterpiece; which drives you off to read the others; and so on. It is impossible to write about memory without acknowledging that the gaps are as important as the details. The memoir sections are not just given verisimilitude by the objects and papers Perec refers to, but are wholly created by reliance on them. The results are peppered with self-aware footnotes (“I do not know the source of this memory, which nothing has ever confirmed”). A similar act of establishing foundations can be seen in the W chapters, which open with an outlandish framing device, of a man named Gaspard Winckler going on a quest to find a missing boy whose name he was given. He becomes distracted, however, when he discovers the island of W, and the remaining W chapters describe its sporting life, with the level of detail adding realism just as the bizarre conceit takes it away. W or The Memory of Childhood is not two books in one, but three. There is the diversion of the surface story. There is the weaving of history into it. And there are the deepest truths which are “bound up with the matter of writing and the written matter, with the task of writing as well as the task of remembering.” Remembering is a task because it is painful, not just for the child of European Jews in the 1930s, but for any child of its parents. There are things that we, or others, would prefer to forget. If, per Salter, “the only things that are important in life are the things you remember,” what does that imply for Perec? With W or The Memory of Childhood, he has created extravagant, mundane, inseparable fictions which are bursting with truth. I write: I write because we lived together, because I was one amongst them, a shadow amongst their shadows, a body close to their bodies. I write because they left in me their indelible mark, whose trace is writing. Their memory is dead in writing; writing is the memory of their death and the assertion of my life. I’m a big fan of Perec, and this work is my favourite of his. I appreciate the way that what goes lost stays lost – the young child from the first section is never discovered, nor is the truth about Perec’s childhood. Most narrative is about rescue and closure, about setting a problem or defining a loss or creating a mystery that is solved with a return to wholeness in the final pages. Instead Perec manages to make those gaps and silences resonate with meaning as the reader moves through the stories, so that loss itself and the absence of meaning become the focus. I have also read A Man Asleep and am not clinically depressed – so it is possible to dodge that particular bullet! Thanks for your comment, litlove – you put it beautifully and rather more succinctly than I could. I do intend to get hold of Things/A Man Asleep, though I still have Three (not yet reissued by Vintage here, but perhaps it will be soon) and A Void, not to mention his collected pieces Species of Spaces to get through. Lovely review John: Perec is a giant, one of my favourites. It’s great to see the renewed flow of his work being made available in translation. 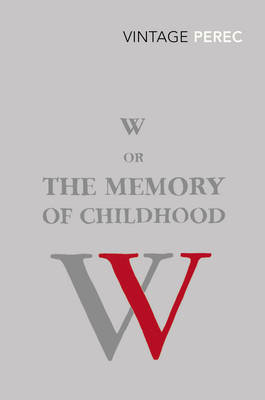 An interesting analysis of “W or the Memory of childhood”. You’ve neglected to refer to the hidden meanings of the Island narrative, though, methinks. While Perec seemingly had no childhood memories and had to fabulate a good deal of these memories from childhood photos (his father was killed during WW1 and his mother was deported to Auschwitz were she died, leaving the 6 year old Perec with his aunt in the south of France) many Perec critics view the Island narrative in “W” as an attempt to visualize the horror of the holocaust and particularly that of the concentration and death camps – an experience which Perec did not encounter himself but nevertheless one which ultimately shaped his life as a child and as an adult. This ultimately makes reading “W or the Memory of childhood” an alternative autobiography of a writer seemingly without a biography.. I have not read Perec and I know why. I have never been able to get over the beard/no moustache thing. I have such a strong physical aversion to that look. All men who have it give me the creeps. Avoid the Lincoln Monument, Linda. Perec grew the beard to hide a scar on his chin from his days in the parachute regiment. Or did he? Thanks opus911. I did quite consciously not refer to the meaning of the island narrative, because I think it is something best discovered by the reader – though I suspect my hints in the post above might be enough anyway for some to pick it out. For that reason please forgive my liberty in editing your comment to warn of spoilers. My aim in writing these blog posts is to make something which is of equal interest to those who have read the book and those who haven’t. I am sure I do not always (if ever) succeed, but I think it’s important to allow those who haven’t read it to experience the book unspoiled by too many details. Richard, thanks. I picked up a Harvill Three last week, after finishing W. And I will read your A Void piece, thanks for the link. I do like Perec and read this recently – I have no real idea what to say about it yet, though I did love it. In any case, another fine review. How many occasions are simliar, John, in that you have to just get on the page and see what emerges? It’s a particuarly good job with what you say in mind. There are a few books that surely demand a certain slant or emphasis, whereas I’ve read a couple of books recently that, personally, I wouldn’t know where to begin with a review attempt. Omon Ra being a good example, as well as the above. More recently I’ve been finding myself coming to the screen without a clear idea of what to say: here, or with Nicholas Royle’s Quilt, or with Denis Johnson’s Jesus’ Son. Maybe that’s because the books don’t conform to a particular genre or type. The effort of actually working out the book in my head is a pleasurable task though: if, that is, I can get more than half an hour of uninterrupted time to think about it. You know yourself that with the pram in the hall, that’s an everpresent challenge. Indeed! And some doughnuts are all hole, aren’t they? I had a quick read of the first few pages of Pigeon English the other day – it was pretty difficult to read from an ‘annoying’ point of view, I must say. You could see the craft, but…in fact, the fact that you could ‘see the craft’ was possibly problematic. Isn’t it worth trying to read him in French? It’s not especially difficult if you have normal reading competence and widens the range of what you can lay your hands on. As regards the beard/moustache issue perhaps reading him with a paper bag over your head might help. It might be, Nicholas, though my A-level French from (crikey) twenty years ago now might not constitute “normal reading competence.” Speaking of beards, I recommend Mr Beard’s link above (or click here), which is a lipogrammatic interview with M Perec from beyond the grave, in which the lovely Gilbert Adair gets what can only be described as a lit-slapping. This means that Richard Beard believes that the French original is the only way to properly read La Disparition (though what, I wonder, of the other English translations, listed on the book’s Wikipedia page?). My favourite Perec novel, as I’ve said elsewhere, and, along with Sebald’s The Emigrants, the most consistently chilling take on the Holocaust to have been produced, precisely because it operates through avoidance, erasure and analogy rather than by tackling the horror head-on. The only Perec that hasn’t bowled me over is 53 Days, but I’d have to read it again to remind myself why. And yes, I should try to read him in French. Although I’ve read quite a bit of Perec in Italian, when English translations weren’t available and, like Bernhard, he’s someone whose essential flavour seems to survive translation. Which, of course, is no excuse. Yes, it is unfinished – which may explain why it doesn’t work for me, though Harry Mathews was one of its editors and I can’t imagine anyone better; and you’re right to put quotes because that’s the way it is, I don’t remember why. Yes, I must re-read it! what a surprise to see you review this book – by far the most powerful book i have read since i began reading, and the subject of a chapter of my thesis! and to think i had never heard of it before my advisor said i might want to give it a look through. . . .
your review was very good – as always – and touched on a lot of things that took me quite a while to see while reading this book. a question, though: do you really think this is a story that applies to all children who have parents, as you put it? is Perec really writing the universal experience, ‘not just one phase of time in one continent but all humanity throughout history’? (is the scepticism coming through??) i think the story is particular to Perec and those who suffered a similar experience. the fact that he compares it, at the end and somewhat out of the blue, to the detentions and disappearances in Chile seems to reinforce the point – once again Perec’s grasping for a comparison that doesn’t quite fit (or does, but too conveniently to rest peacefully). Hi Jay, and thanks for your comment – though I’m surprised that you were surprised to see me review this book! My comment about “all humanity throughout history” was intended to reflect my belief that the sports analogy, while representing the Holocaust or concentration camps specifically, is also a useful representation of the very ‘survival of the fittest’ ethos which is drummed into us not just by society but by our evolutionary impulses. In that sense, sport, which is seen as an intrinsic good – wellness, good health, competition – can be viewed as a negative influence on our worst qualities. In the book, the winners of the races thrive, and the losers are starved. You just have to look at any tabloid newspaper in the UK the day after a defeat for the national football team – the hatred, ridicule and calumny poured on the team’s and the coach’s heads – to see that Perec’s exaggeration is just that: an exaggeration of an attitude which already exists and persists. I agree though that the Chile reference seemed a little tacked-on, though again it goes to show that the human attitudes displayed on W are not limited to one time or place. I read this book and it was literally, no exaggeration, the worst book I have ever read. It’s not even a story, it’s a book. This is basically a crappy, dull and utterly pointless diary and a copy of the manual of the official rules of the Olympics. Which also makes no sense because although the island is ruled by sport, judges can throw all that out the window, stop a race and say ‘whoever can stay still the longest wins’. It seems that perec wanted to make something that sounded horrid but actually babbled for 200 pages and made no sense becaus he couldn’t create a story, narrative or crisis. I’m sending my copy back to the distributor with a note saying ‘I won’t ask for a refund, but what I will ask is that you burn every copy of this travesty so that no one can ever buy it again’. If you think book burning is the answer, you haven’t understood the question. Which, interestingly, is the question Perec’s book is asking. I am writing about W or the Memory of Childhood, I am exploring Memory and history in the novel. is there any one can help. I’m studying Perec for University, and I love how nerdy he is with words and letters. The title is an obvious example, but I thought I’d also put in a note about the dedication in the book, ‘Pour E’. He wrote La Disparition entirely without the letter E, seen as a way or representing the loss of life, particularly but not limited to Jewish life, brought about by the Holocaust. So the E represents the same thing here- it get’s exciting when you say it allowed. The French E is pronounced like the French ‘eux’, which means them. So, the book is dedicated ‘to them’. Nice little touch, I think.